Few know about the MenB vaccine and many doctors are not talking to their patients about it. We want to arm parents and young adults with the information to act – to proactively talk to their healthcare provider about MenB and the vaccine available to help prevent it. 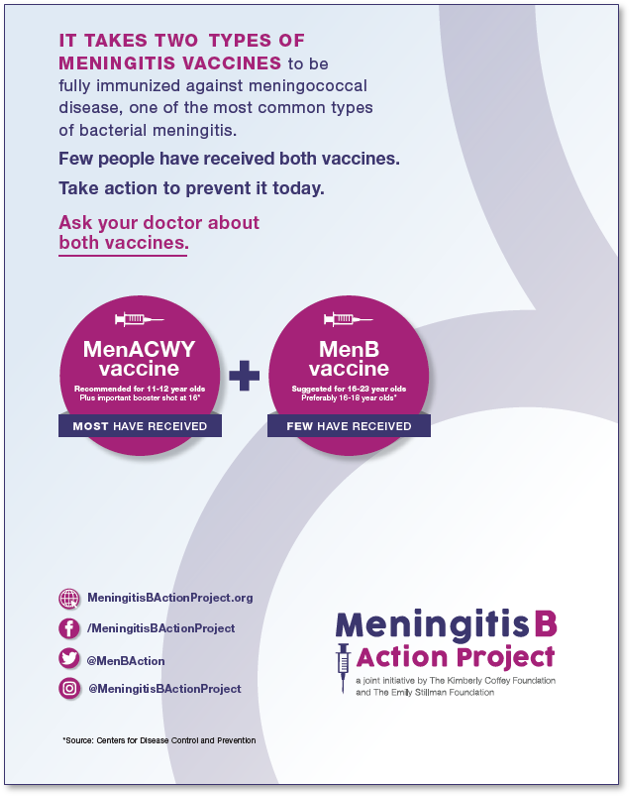 We want to encourage the medical community, as well as high school, college and university administrators to talk to their patients and students about the MenB vaccine. How can you help? Below you can download (and share!) educational materials and posters, as well as an action kit loaded with ideas to help get the word out in your community. Want to stay on top of the latest news and materials from the Meningitis B Action Project? Sign up for our newsletter. 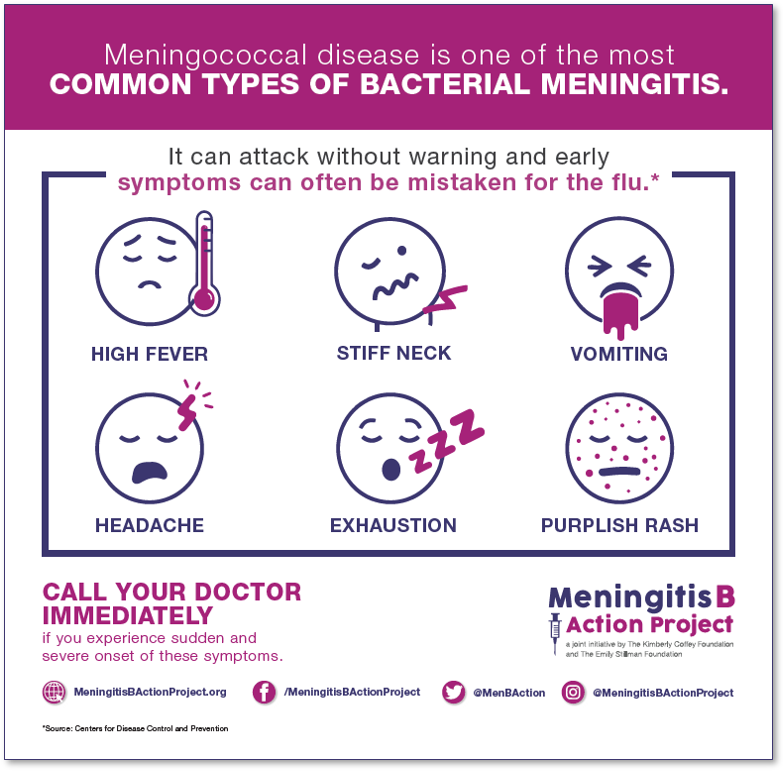 If you have any issues downloading or printing our materials, or are interested in a large bulk order, please contact us at info@meningitisbactionproject.org. Here you can find a range of educational materials for parents, students and healthcare practitioners. Materials also available in Spanish upon request. Click on the link to read the full article that supports each stat. Stat: MenB is responsible for all US college outbreaks of meningoccocal disease since 2011. Outbreak of Serogroup B Meningococcal Disease at a University — California, 2016, Morbidity and Mortality Weekly Report, US Department of Health and Human Services/Centers for Disease Control and Prevention, May 27, 2016, 65 (20). Stat: MenB accounts for 50% of approximately half of meningococcal disease cases among 17-22 year old. Serogroup B Meningococcal Disease Outbreak and Carriage Evaluation at a College — Rhode Island, 2015, Morbidity and Mortality Weekly Report, US Department of Health and Human Services/Centers for Disease Control and Prevention, June 12, 2015 / 64(22). Stat: MenB is 3.5 times more common in college students versus noncollege students. Stat: Many doctors are not talking to their patients about the MenB vaccine. Stat: More than 80% of parents have not heard of the MenB vaccine. Basta NE, Becker AB, Li Q, Nederhoff D. Parental awareness of Meningococcal B vaccines and willingness to vaccinate their teens. Vaccine. 2019 Jan 21;37(4):670-676.